Sheet music for the harp, zither, dulcimer etc. 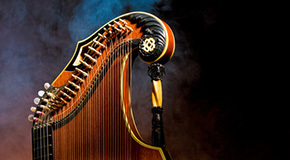 Within our large selection of sheet music titles for the harp, Irish/folk harp, zither, dulcimer, mouth harmonica, blues harp, pan pipes and bagpipe contains something to suit every taste. Here you will not only find instrumental method books and études, but also musical pieces with and without accompaniment or for several instruments.